Vegetables are packed full of health-protecting nutrients to keep our bodies going and it’s been proved that eating more vegetables every day is one of the most important steps we can take to help ward off disease. Fresh vegetables are excellent, but so too are fast frozen and canned vegetables. It would be difficult to think of a tastier, low calorie way to improve our health; and eating more vegetables is much less expensive than spending money on supplements and bottled vitamins. Most of us are aware of the ‘five-a-day’ recommended servings for fruit and vegetables. However, that is the minimum we should eat, and reaching that target can be far easier than you might expect. Important vitamins in food can be lost in the cooking so it is a good idea to try to have uncooked vegetables a few times a week. Salsas have become very popular and, once you get used to making them you will be able to ring the changes with your own recipes. Use combinations of diced peppers and onions, celery and chillis, teamed with tomatoes and cucumber, garlic, herbs and grated fruit zests and fruits such as mango, mixed with a little lemon or lime juice and seasoning. 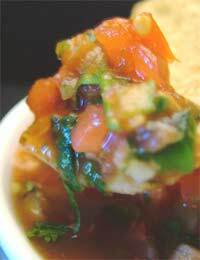 Make the salsas about 30 minutes in advance to allow the flavours to develop. This recipe using popular vegetables is easy to prepare and is a very low calorie 130 per serving. Serve it with roast or grilled meats. Peel and quarter the beetroot and the onions. Heat the oil in a large saucepan and gently saute the beetroot and onion quarters. Add the fresh rosemary and cook for 1 minute to release the flavour of the herb. Add the wine, stock and vinegar and bring to the boil, then reduce the heat, cover and simmer for 1 hour until the beetroot is tender. Remove the lid and simmer for a further 15 minutes until the liquid reduces to a glaze. Season and discard the rosemary. Spoon a little crème fraiche or yogurt over the dish if desired, and garnish with rosemary sprigs. This low calorie recipe can be served as a main course with rice and a green salad, or as one of several side dishes in a curry meal. It has 155 calories per serving. Peel and finely chop the onion. Peel and roughly dice the swede, carrot and parsnip. In a large pan, cook the vegetables over a medium heat for 6 minutes, stirring frequently. Add the spices and 285ml water and simmer for 15 minutes. Cut the cauliflower into florets and stir into the pan. Cover and simmer for a further 20 minutes. Peel, core and roughly chop the apples. Cook over a medium heat for 4 minutes, add the sugar and stir into the curry. Garnish with coriander and serve. This quick recipe combines broccoli and green beans in a savoury sauce and has only 54 calories per serving. Serve with potatoes. To make the sauce, combine the stock, vinegar, oil, soy sauce and ginger in a blender with the spinach. Blend until smooth. Boil roughly an inch of water in a pan and add the beans and broccoli. Cook, covered, for 7 minutes or just until the vegetables are tender. Drain. To serve, drizzle some green sauce onto each plate and top with a quarter of the green beans and broccoli.